Eleven months on from our inaugural event last August, we thought it was about time to retrace that wholly enjoyable, heather-clad route around the harsh moorland landscape of Bleaklow. 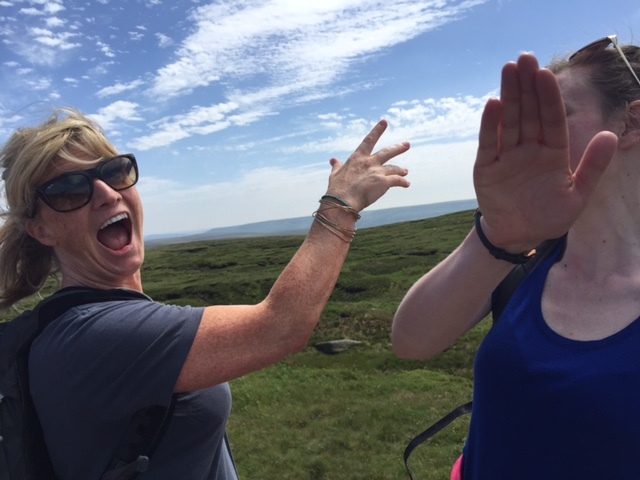 A classic, if slighter shorter, hike than our last two forays towards Kinder and one to allow us the added bonus of an hour later rendezvous point in both Manchester and Glossop. 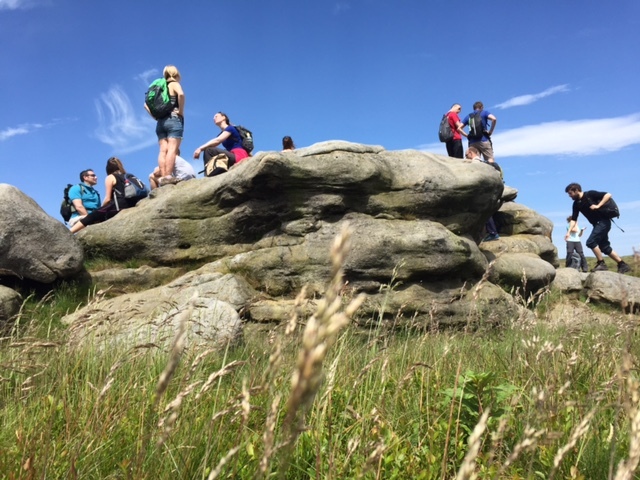 Despite being only three weeks since the last walk, an expectant crowd of 27 had signed up for the occasion and with a smiling nod towards the weather forecast, unusually, just the one dropout was negated by a last minute registration. My pre-walking ritual predictably involves the same meal, brew and pear juice at Carluccio’s, always followed by a quick dash into Sainsbury’s for some packed lunch before we hop onto the Glossop train. Friday works best for Freshwalks. I really think it’s the only day when everyone can truly switch off and embrace the school-trip style giddiness. 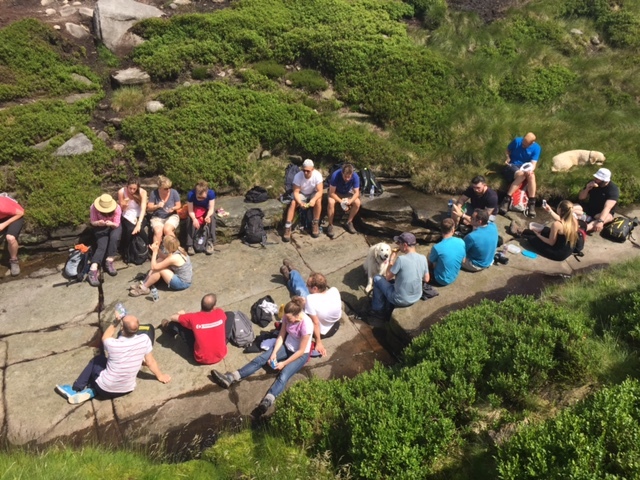 And as is always the case, we’d attracted a healthy mix of regular faces and a lovely bunch of Freshwalks first-timers, who were ever so slightly in the majority. Back for more, the likes of well-known Manchester business faces, Chris Marsh (UKFast), Simon Swan (Hiring Hub) and David Coulter (HR Heroes). Some of the newbies included Michael Lister (Marcia Mediation), Mike Henderson (Riskbox), Katya Willems (BBC Five Live), Richard Taylor (Fatsoma) and Hannah Matthewman (Tunafish Media). It felt a really well-balanced group and as we streamed out of Glossop, a tightly-knit one too, as the rear virtually shadowed the pace of the front. However, it wasn’t long until painful memories of last August’s initial ascent up Lightside came flooding back. That time, I was lumbered with a hangover. This time, I’d hardly slept. Different rationale, same pain. 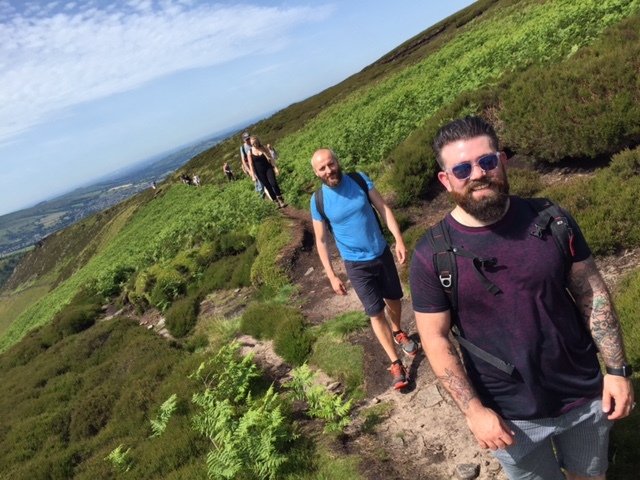 It’s not as steep as the climb up to the Kinder Plateau but it’s punishingly long and most were gasping for air in this mid to late morning heat. Certainly a difficult environment to make early ice-breaking conversation so I hope I made a degree of sense to Louise Phillips (Mazars) in between my non-deviant heavy breathing. The route then flattened out and conversations were able to flow much easier as we headed towards our planned lunch-stop at Yellow Stacks. It’s such a pleasant spot, amplified by the glorious sunshine which was by now relentless. The sound of trickling waters and the chatter and laughter generated by deepening bonds is always a sheer bloody joy. After a leisurely break – we could honestly have stayed there all afternoon – it was time to hit the tracks again. We had a couple of planned stops before thinking about the return trip. The vast B29 Superfortress ‘Overexposed’ crash site, near Higher Shelf Stones, never fails to capture the imagination, in the most eerie manner possible. Thirteen people died here – and somehow, you can just feel it. After another dose of scenic admiration from the wonderful and craggy vantage point of Higher Shelf Stones we snaked our way steeply back down towards Doctor’s Gate, the old Roman road that rolls gently back into Old Glossop. This route is gorgeous with an eclectic mix of natural obstacles where stream-hopping skills and good boots start to come in real handy. Though at least a solid hour walk back into Old Glossop, this is very much an obvious home straight for this route and we happily allow walkers to stretch out and move at a pace they feel comfortable with. With stalwart, Danny Franks (SBS Networks) towards the rear, we pressed on from the front to set an appropriate pace for Helen Dibble (The Great Little Marketing Co.) to catch an essential 16:20 train to Glasgow. “Of course, we’ll be back in time” – I’d promised in the week. Half past three yesterday and I was sweating buckets to make damn sure – bit too close for comfort but we made it. Just. And this extra pace granted me the luxury of a prime seat outside the pub and a good 15 minutes drinking advantage. Wren’s Nest tasted outrageously good under the intense late-afternoon sunshine outside the Wheatsheaf. Happy days. Afforded typically fantastic hospitality by John and Diane, tired walkers readily refreshed with stodge, ale and wine. It wasn’t the latest session we’ve had by any stretch of the imagination and by about 8.30pm the last of the group headed wearily back to the station. A huge thank you to everyone in the group. What lovely people this walking lark attracts. Hopefully I’ll see you again soon. We’re back on 14 August and will announce a September date soon enough.